For anyone who is unfamiliar with multiples lingo, singletons are what we parents of multiples call our children when they are born by themselves. I never used that word until I found out I was having twins, and never hear parents without multiples use it. Why would you? Haha. So now you know. When I first found out that I was having twins, my initial reaction wasn’t ‘How am I going to do two babies at once!’, it was ‘What is this going to mean for my son?’. 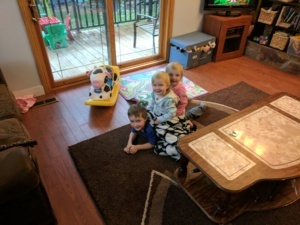 I knew that the bond between twins tend to be very strong, and I was very worried that my son would end up being a third wheel when playing with his sisters. I wanted to make sure that he wouldn’t feel lonely at home and that he would still have siblings to play with. It was something that really worried me. I did lots of research on singleton/twin dynamics in siblings in hopes of learning something that I could do to make sure he would feel included in his sisters lives. If I’m being honest, I couldn’t really find a whole lot on older singletons with younger twin siblings. There was lots about older twins and younger singletons, but I didn’t find it very helpful because I had found that with older twins, they already had their relationship established before the singleton came into the family. I’m no expert on family dynamics other than my own, but this is what I have found with my kids, and what I really needed to read when I was doing my own research. When you introduce twins to an older sibling, the twins don’t know anything different than having that older sibling. The older sibling becomes a role model for them. I was worried about Jack feeling left out with the girls playing together, but what has happened is that the girls take turns playing with Jack, or they all play together. Sometimes Jack plays by himself while the girls play together. But there is never really any favoritism between the kids. I’m not sure if this is because of the way Jarrett and I have approached our parenting, or if it is just natural dynamics that come out of having an older sibling with twins, but Jack loves his sisters and they love him. 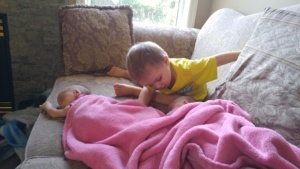 We always asked Jack to play with his sisters, and to make sure he included them in playing with toys and games. In saying that, we also make sure he has his special time where he gets to do things like puzzles and other activities with us that are more advanced just for him. This dynamic that was established may also be because Jack was only two when he got his sisters. He hadn’t established an only child mentality yet when we had the girls. When I was pregnant with the twins, we told Jack every day that he was getting two babies that he could love and told him how exciting it was that he got two sisters. When they were born, they were his babies too. He has helped me so much with the girls, and now has more sway over the girls than I do sometimes. The past month, I have been transitioning the girls to walking everywhere instead of using the stroller. Pretty much every walk, one of the girls decides she is done and just wants to sit on the ground. In typical parenting style, I keep walking while calling out goodbye to the child on the ground in hopes of getting them to come running due to fear of being left behind. I can’t say this has ever worked for the twins, but the reason why warms my heart and makes me feel like I have done my job as a parent. Whenever I start walking away, Jack and his other sister get extreamly upset at the prospect of leaving their sibling behind. I can never get very far until Jack runs back, along with his sister to convince the other sister to come. It works pretty much every time. I can’t say how proud it makes me to see my son walking up to me, holding his sister’s hands, with all of them ready to continue our walk. It is a wonderful feeling. . So, for those of you parents who are worried about the singleton/twin dynamics of your children. There is hope. I’m not going to promise anything, but I have to say that I am pleasantly surprised, and relieved that over the past two years, all three of my children have become best friends. They look out for each other, play with each other, still fight with each other, but ultimately, love each other very much. It has been a joy watching them grow and develop this wonderful dynamic, and I am so excited to watch how their relationships will continue to evolve. Thank you – this is exactly what I needed to read today. I’m pregnant with twins, already a mom to a 17 month old boy who will be roughly two when they are born. We have been thrown for a loop with the twin news, and are especially nervous about him feeling left out. Good to know there is hope! No problem! I felt exactly the same way. I was more worried about my son and what it would mean having twin siblings. I’m happy to say that my twins are now 3 and he is 5, and they are all best friends. 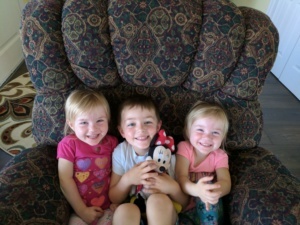 They love their older brother and they all play together really well. It’s really nice as a parent to see such a strong connection between all of them!